Yuasa as leading manufacturer of maintenance-free, valve regulated stationary lead acid batteries has been improving all properties determining reliability and operational performance. The effect is, that the end-user acquires a fully mature and commercially accepted product which, typically has a service life of up to 5 years when operated und recommended conditions. 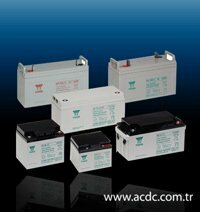 Yuasa NP Series batteries can be permanently put into operation laying on the side; any operation upside down is solely permissible for one discharge operation. The battery container is manufactured from ABS. Container material for FR batteries is flame-retardant according to UL 94 VO, equivalent to EN 60707. Manufacture of Yuasa Batteries according to ISO 9002 Quality Management Systems and ISO 14001 Environmentally Management Systems. Extension of service life by reduced speed of corrosion by means of special alloy. Entered in the UL Directory of Recognized Components, File No. BAZR2.MH12970. Absorbing Glassmatt Technology ( AGM ) in which the electrolyte is fully absorbed-no free electrolyte . Maintenance-free operation, no addition of water required . Heavy duty grids giving high performance and long life. Classified as "non-spillable" and therefore exempt from IATA Dangerous Goods Regulations. Extendedshelf life at low self-discharge level, approxemately 3% per month at 20°C.